One hundred years of service (95 as a military flying station), means that RAF Northolt, based in South Ruislip is a reflection of aviation history. Northolt pre-dates the establishment of the Royal Air Force by almost three years, having opened in May 1915. It has the longest history of continuous use of any RAF airfield. More recently it has become a multipurpose Tri-service base serving the growing needs of a modern Armed Forces. 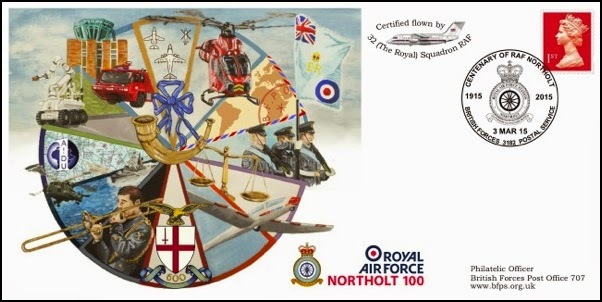 To mark this historic centenary the British Forces Philatelic Bureau, in conjunction RAF Northolt, has produced a special commemorative cover that will be released on the 3ʳᵈ March 2015. The cover image uses the spoke from the station badge to depict the various units and activities that are now part of the base. This issue will include a limited edition of 500 flown covers, some of which will be signed by the Station Commander and Officer Commanding Operations Wing. Most of the covers have been reserved for RAF Northolt, however BFPS has secured a limited quantity for sale to its customers. The covers may be purchased from the BFPS online shop (www.bfps.org.uk/shop). These will cost just £6 (UK/BFPO postfree) for the unsigned version, £8 for the flown only and £12 for the signed versions. They are available to order now on a strictly first-come-first-served basis. The covers are also available by post by sending a cheque (payable to ‘BFPS CIC’) to BFPS, The Old Post Office, Links Place, Elie, Fife, KY9 1AX, United Kingdom.